A friend who has 10 Sony Readers (don't ask) finally relented and loaned me one for the month so I could finally get some serious hands-on time. I'd spent minutes with it before, but this time I'm using it in all the places I ordinarily use books...reading in bed, etc, as well as trying it in places where I wish I had a book, but the stack I'd want to carry would be too unwieldy. Since I'm a techie, I've got a folder on my desktop called "Stuff to Read" where I put all the PDFs that I always mean to get to. I usually read them on long plane flights, except reading on the laptop on a plane is so unsatisfying and lasts only a few hours until the laptop battery dies. I almost thought I was screwed when I started installing the Sony Connect software because halfway through the installation on Vista it starts rolling back. I looked in the Sony Support site and it said "Vista support for the Sony Reader is planned." However, I noticed in the forums at MobileRead that the software had updated itself yesterday. Kind of a bummer for me as I couldn't update software I couldn't install. Some digging however got me to this other support page in a totally different section of the Sony Site that has the download links for the Sony Reader Connect Software and Firmware. Here's my original 15 minute impressions in italics, along side my update impressions after living with and using the device. It's very light and very comfortable. It has a nice flip around case and reminds me of a larger Palm V - to this day still Palm's most elegant PDA, IMHO. Still true. It's very comfortable to hold. The size is really perfect. It could be a smidge thinner, but any more and it'd feel flimsy. I do wish the screen was larger - meaning I'd make the bezel smaller...make the screen go closer to the edge. There's too many buttons. There's ten 0-9 buttons that are multi-purpose (multi-purpose buttons are mistake cop-out number one in good design, IMHO). They are used to access the internal menus by numbered item, but their primary function is to quick jump a percentage of the way into the book. So pressing 5 gets you 50% of the way into the book. There's no way to go directly to a page that I could see. Yes, the 10 numbered buttons are ridiculous. A touch sensitive slider would have been a much better metaphor. There's multiple ways to turn the page, and they are both on the left side of the reader. The two buttons on the left bezel while oriented up/down, are actually left/right page turning buttons. I think it'd have been more thoughtful and innovative to just touch a long line on the far left or far right bezel to turn the page. This is my #1 on going irritant with the device. Now, in fairness, you'll just pick a page turning technique - one of the three - and use it, but for me, the very existence of the other techniques shows a shotgun approach to industrial design. This is not Sony's best design. At all. The memory card slot supports both Memory Sticks and SD Cards - choice is good. Yes, this rocks, as I have both cards lying around the house. The lower right corner features a joystick-like, sigh, multifunction, nubbin. It's a little confusing because I assumed that the page-turning interface would double as the main interaction element for the utility UI. I could see where a joystick/nubbin would be a good idea for a multi-function devices, but even though this thing plays MP3's, it's called the Sony Reader. It's a reader. Adding a multi-functional interface metaphor like a joystick is a User Experience cop-out. The interface should be minimal - like a book, natch - and specific. The screen, the screen. It's all about the screen. It's eInk. It's not an LED - that's important to note. It's 170 DPI with four levels of gray, versus 96 DPI (or possibly 120 DPI) on a laptop or PDA screen. The battery is used only to change the configuration of the screen i.e. you only use power when turning the page. The screen has a refresh of about 1000ms, and rarely, but it happens, you'll see a ghost of the previous screen because the "turn" didn't completely "take." However, when it's not turning, it's amazing. It really is. It's TOTALLY comfortable to read. I have read a 600 page book on it and it didn't hurt my eyes. You can apparently read RSS feeds on it as well, downloadable via USB. Interestingly, RSS might be the killer app for this Reader, rather than books. Yep, it was too good to be true. Instead of being able to subscribe to any RSS feed, you're only allowed to subscribe to the 12 blogs they've got partnerships with, so basically Slate, Engadget, the usual suspect. Wow. That's so lame it's really hard to express. It also has volume buttons and headphones so you can use it as an audiobook reader or MP3 Player. This also allows you to read while listening to background music. This seems like a good idea, and the audio on this thing is garbage. It doesn't support Audible (which Rocks by itself, by the way) and playing MP3's has a hiss in the background. Why bother I say. The guy at Borders said they haven't had to change the batteries on the demo model ever. They say 7500 page turns on a single battery. If you're not playing music the battery life is obscene. I'm going to take it on a week-long trip and see if it'll last the whole time. I suspect it will. There's 3 font sizes...each is comfortable, even the smallest, but I'm a big font guy so I think I'd have trouble committing to a size. I'm still having trouble committing to a font size. I feel like I'm reading a children's book when the font size is so big, but when the font is big, it's very comfortable. I'm mostly using the small size which is comparable to a regular paperback's font. Here's the saddest part. The Desktop Connect Reader software is so profoundly bad, so poorly designed, so truly evil that there are not word to full express the breadth and depths of its unspeakable lameness. It tries to be iTunes. I know iTunes. 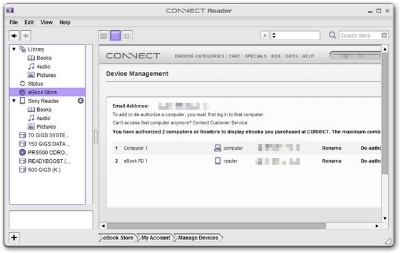 Connect Reader is no iTunes. It kind of looks like Windows Executive. Remember that? The "browser" area doesn't use a known Browser Renderer (IE, Gecko) but rather some internal Sony Voodoo. What do you care? It's not accessible via the keyboard. That means while you can Tab between Text Fields, you can't access drop downs without the mouse. Yikes. Not only is that jarring as you try to fill a field out, but it makes the process nigh-impossible for non-mouse using folks. Drag and drop is partially implemented. Partially meaning I could only get one scenario to work, and that was dragging files from the Library node to the Sony Reader node in the tree. You get a helpful international NO symbol if you try to drag files from your hard drive to the Sony Reader or from the file system to the Pictures or Books nodes. Purchased content isn't automatically copied to your Sony Reader, you have to manually drag it, and again, only to a single node in the tree. One thing that isn't that bad is the PDF support. You just drag a PDF into the Library node, then AGAIN to the Reader from the Library, and you're set. At least that works. There is rumor that PDFs over 1000 pages have problems, but I personally haven't any to test. Most A4 or 8.5x11" PDFs, however, have very small text on the 6" screen, so you need to either resize the text with a PDF editor, or rotate the Reader's screen and view the pages one-half at a time. It's not ideal, but it's passable. I would expect I'd have to come up with a better resizing strategy...however it's largely dependant on the way the publisher created the eBook. For example, I tried to read 37Signals "Getting Real" PDF, a fine book to be sure. However, they encoded it as a paperback sized book living in an 8x11 PDF shell. The book is in bordered areas on the pages. This unfortunate choice in formatting made the book totally unreadable in portrait mode, and kind of small in landscape mode. Therefore, since the quality of PDFs out there is also dodgy, I'd have to say that this device and its associated software isn't even clever enough to be a good PDF reader. Is it worth $300? If you're constantly traveling, always moving and like to bring books with you, possibly. I always want to have 4-5 books with me, and often don't bring them because of space. I ran out of books while in Tanzania recently after only two weeks. Other than that specific problem - that of space - and the cool factor, are books really that much of a hassle? Maybe large technical books and college textbooks, but I suspect that while University-level books are the right problem to solve, that industry would never give up on their lucrative dead-tree process without a hearty push. If this reader would $150, it'd be a no-brainer, but it's not. 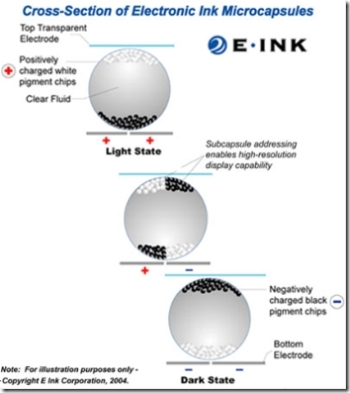 Now, forgetting about this specific product for a second, let's talk about eInk. This screen must be wicked expensive because I don't understand why we don't see eInk in more devices. The simplified idea is that you've got a layer of tiny "beads" filled with liquid. In these beads are little color chips of pigment, white and black. 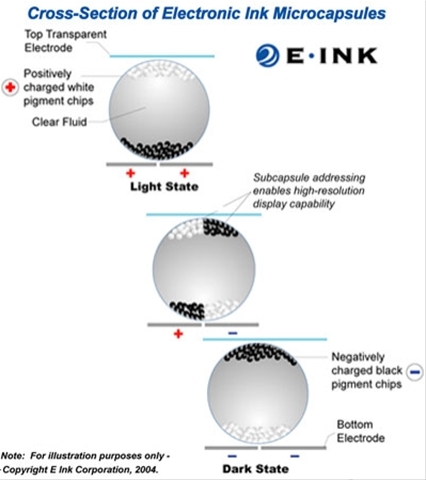 The white chips are positively charged, the black ones, negative. They are inside these capsules that are sandwiched in between two charged transparent plates. The plates are addressable such that each microcapsule can act as a "pixel" or "subpixel" (in two passes) for high resolution display. Have you ever been to a furniture store where they have fake plastic computers and TVs on the desks? From far away you think it's real, but by the time you get close, it's clear that the fake image of Word or Excel is printed on the fake computer monitor. It's too crisp, it's got a flat sheen, rather than the gloss of a CRT or the backlight of an LCD. 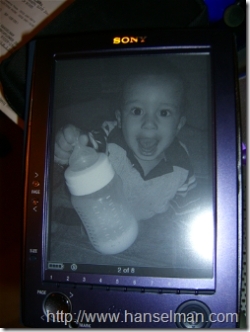 The Sony Reader eInk screen is like that, it's so clear, it looks printed, static, fake. There's no backlight, it's super-high resolution (you can barely see the pixels, and you REALLY have to want to see them) and it's totally flat. Additionally, the viewing angle is virtually 180 degrees. It's damn-near paper. The only think that's "off" about it is the full second it takes to "turn" the page. Otherwise, eInk is brilliant. I have been using my Palm V as an e-reader for years and years now - the backlight feature is SO much nicer than a contemporary blinding white screen while in bed. I also use it as an alarm clock in the cradle right on my nightstand. I have often thought an aftermarket business for this hardware seems obvious - preload the machine with a clean install of the last supported OS, Big Clock, and 8mb of text-only ebooks. The biggest drawback to the PDA in this role is the storage size and lack of decent PDF support, partially a function of the display's bit depth. Any ideal ebook device should provide a perfect dark-room reading experience - one of the few inherent advantages the hardware should deliver but generally fails to due to featuritis. My Treo, for example, can't provide a decent low-light reading experience even if the blinding keyboard backlight is turned off via third-party widgets; setting the reader's screen colors to light on black still leaves a 2mm bright white border aound the application's display screen. The earliest terminal-style display screens were well-designed by thoughtful engineers in their use of green or orange on black, and it's just silly that so often the user has to work to obtain the same dregree of legibility in many situations today. Thanks for the info Scott - much appreciated. I think I'll hold off until someone other than Sony uses the e-ink tech to its fullest. I was really excited until I saw the dreaded 'Sony Connect' software.. I spent too much painful time transfering music to my USB MiniDisc player because of that ghastly designed app, and vowed never to go back! The Sony PSP allows you to drag and drop music and movie files onto its memory stick.. why go back to the bad old way? Very informative and detailed review. Thanks! Have you tried to copy over some technical/programming books to the device? As you point out this would be the perfect device for university/technical books. In general i hate computer books. They're large/heavy, pricy, and take up lots of space. Would be awsome to have an entire year of sutty material on one device. One tablet pc and one e-ink reader would be the perfect pair for a student. llaurén, the device is completely silent. I think the sound was my neighbor's power tools. - Screen is bigger and of higher resolution plus 16 shades of grey. Smaller screens in other devices have the tendency to make you squint. - Uses CF, MMC and memory sticks. - Uses WIFI, LAN and USB. - Bookmarks. When you turn off the device, it automatically creates a bookmark so you can resume from the page you left by just clicking the book's title when you turn the device on. This works with any number of books. - Updating the OS software is completely automated over the LAN. - It's Linux based so it's more open and there are people already hacking it so expect software that can do more than the stock software, like better PDF readers. - Sony's DRM limitations seem to be problematic. - I don't think Sony reads HTML based documents although you can always convery html to pdf. - You can zoom in PDF and annotate on any page. With all the features, the Iliad is slim and light. It's a pleasure to hold. I also recommend getting their case as an accessory to protect the screen. Good if you travel with it. IRex sent me a bonus stylus with the case so now I am covered. So if you order one, order an extra stylus too. The device is useless without one. You are able to put any type of digital book on the reader? I know when I fly it is a huge pain because I usually have 3-4 large programming books that I read through. Also how difficult is it to change between books if you are currently part way through one? That is something that I think would make or break this for me, because I can't seem to stay focused enough to read a book without moving between another one. My last question I have is have you found any readers that are equal to or greater then the sony product, but around the same cost? - You can only buy books through the Sony site!!! That means all the WROX techo books I planned to take with me are not available on the eReader. There are some very slim pickings available that are just not useful as reference manuals. - I live in Australia, and the Sony site will only accept credit cards from the USA. The only way I can buy books is to get friends in the US to send me a gift certificate for which I repay them via a funds transfer. It's all about controlling content which is typical for Sony. 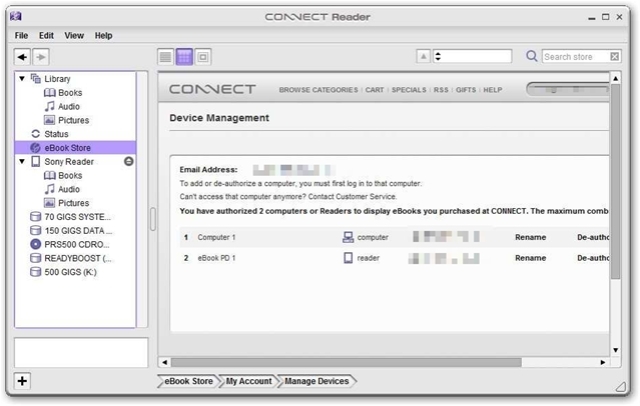 It woud be fantastic if the eReader was compatible with some existing eBook formats so you weren't limited to the Connect bookstore. This is by far the most irritating and limiting factor. 3) PDF's are an area this reader can improve, and I hope they do so - too many are just unreadable even in landscape mode. If you really want PDF as lrf, then see #2 followed by #1. Check out Baen's Universe. If you enjoy SciFi, most of his content is available freely as a download, many formats, but lit is the one to use (HINT: See #1) - if you really enjoy it, then subscribe at some level to get access to the magazine content. Sony is running a $50 certificate for downloads from now until April 30 for any newly registered ereader. This a) drops the price to $299 (still pricey I admit) and b) gets you some content right away. Thanks for an excellent review!! It's the best one I've read on the net for this device. I think I'll postpone my decision to buy the reader until something better comes up. Any owners of the Sony PRS-500 having problems recharging? The first time I recharged (only 2 black boxes in the battery indicator) I left it on the charager for 4 hours, which the manual gives as time for a full charge. After disconnecting the carger, and turning on the reader, the battery level indicator was still at half charge. I then left it on the charger overnight with the same results. Then I pressed the reset button and the battery level indicator showed a full charge - HOWEVER, all my bookmarks were gone and the reader didn't remember the page I was reading. I called SONY support, but their only suggestion was to send the reader back for service! Jim - What you describe seems to have happened after the last software update. I have precisely those problems with mine, which never had a problem before. No fix suggested other than lobbying Sony that they have a problem on their end. Re: recharging the Sony reader. I was having trouble as described above. I always turned the reader off when trying to recharge. There are no instructions to either charg with the unit on of off, but all other battery operated devices charge faster if the unit is off. HOWEVER - the last time I recharged the reader, I left it ON, and it recharged without problems and the battery level indicator was "full", and I did not have to do a reset. Try recharging your ebook with it turned on. This is a bug in the firmware. The battery indicator on my e-reader never went up when charged, it only went down. One week or two I didn't bother recharging and the indicator went to zero. This brought up the exclamation page preventing any more reading until the unit was charged. So I charged it overnight but the indicator did not change and the unit was *still* unusable. However, the battery *is* charging and is fully charged, despite what the indicator and the unit thinks. The solution is to charge up as usual, and with the unit turned on and unplugged, plug the a/c charger in. This will reset the indicator to full and allow the unit to be used again.